1. If you need to wound a tree for building a tree house or general pruning, the dormant winter season is the best time of year to do it. The scent from tree wounds can attract insects that spread oak wilt or Dutch elm disease. We’re also concerned here in Pennsylvania about the spread of the Emerald Ash Borer. But insect and fungal activity is at a minimum during the winter so the transmission risk is very low. 2. Building in winter, just previous to the growth season, will also permit the tree to direct its spring vigor toward responding to the attachment point injury and the weight and wind sail forces from the new tree house. The tree will grow reactive tissue around the attachment points which helps the tree compartmentalize or “wall off” the wound. This extra growth, over time, is beneficial for the strength of the tree house and resists spread of decay in the tree. Trees also grow more and thicker structural roots on an as needed basis, so they will grow more roots to respond to the added wind sail effect created by tree house walls and the overall weight of the structure. These factors immediately shock the tree, but it will likely regain balance over a couple growing seasons. A tree house built at the end of winter, just previous to the onset of the spring growing season, will have the full benefit of that year’s reactive growth to help the tree adjust to the new wounds and loading. 3. Soil disturbance, one of the most serious tree threats during tree house construction, is much reduced during winter when the ground is frozen. Foot prints and vehicle tires can seriously reduce the ongoing health & vigor of trees when they compact the soil. Trees need air spaces between soil particles to aid in absorbing nutrients. But frozen soil becomes rigid, protecting those tiny air spaces from compaction. 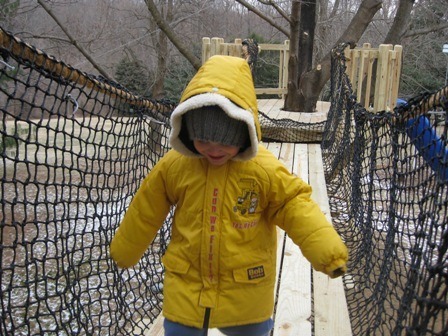 Winter can be a great time for building tree houses. It may not be when most humans would think of tackling an outdoor project, but when we consider the arboreal benefits, perhaps more of us will wear an extra layer and build our tree houses over the dormant winter season. Just the information I was looking for. I am looking to start building in the winter, but was told that it is best to start in the spring. We have a few projects this year where we have set posts and TABs already, but are waiting until Springtime for the carpentry phase. It’s a good compromise between schedules, budgets, and weather. I did a late November platform with Treetop builders and it worked out great. The trees are healing nicely where the tabs attached to the trees and the treehouse was completed in the spring.